Asteranthera is a monotypic genus native to the humid forests of Argentina and Chile. Its single species, Asteranthera ovata, is an evergreen, scrambling vine. The plant has small rounded leaves with scalloped leaf margins. 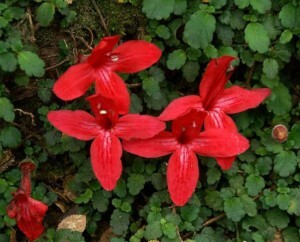 The two-lipped, tubular red flowers with white markings appear during the summer. It can be grown as a climber or a ground cover in warm-temperate climates and will tolerate a few degrees of frost, if conditions are otherwise favorable.